Perhaps a better analogy would be calling the current situation in the South China Sea a prospective remilitarization-of-the-Rhine moment. In any case, Webb is right that there are things to worry about. China has been systematically occupying and fortifying tiny islands in the Paracel and Spratly chains for decades, as have other claimants like Vietnam and the Philippines. But growing Chinese aggression against the maritime activities of Vietnam, which has included damaging the equipment of oil exploration vessels and attacking Vietnamese fishing ships, has the region on edge. China has also, in 2010 and 2011, conducted two lengthy naval exercises in which her naval task force drilled in the Miyako Strait in the Japanese archipelago. (During the most recent one, in June 2011, the Chinese were observed launching a maritime drone from one of the ships while operating near Japanese territory.) Coincident with the task force deployment, China’s special forces conducted their first-ever joint training with the special forces of Indonesia, an interesting and high-profile rapprochement between two nations that in many ways have kept a wary distance for decades. At the end of the exercise period (mid-June was a busy time for China’s maritime assertiveness program), the patrol ship Haixun-31, nominally a fisheries protection/maritime security vessel, conducted a patrol of disputed waters in the Spratly and Paracel Islands on the way to and from a port visit in Singapore. Singapore had not been told in advance that the ship would be performing this mission, and was thus put in a difficult diplomatic situation, ultimately lodging a protest over the implication of Singapore in Beijing’s assertion of excessive maritime claims. While this Chinese action may seem to Americans like the least significant among recent events, it is in some ways the most important. Singapore, located at the eastern entrance to the Strait of Malacca (SOM), has long maintained a careful neutrality on the most freighted regional issues – and has been bolstered in this posture by the United States. Singapore’s independence and neutrality are guarantors of international access to the SOM, a linchpin of US security policy in the region. Singapore makes it a point to get along with everyone, but to be in no one’s pocket; her arrangements with the US are friendly and of long standing, but do not involve a defense treaty like the ones we have with the Philippines, Thailand, and Japan. But Singapore is tiny; her independent status is largely a quiescent artifact of the Pax Americana in the region. A diplomatic raid on Singapore’s neutrality – effectively what the Chinese patrol ship’s visit amounted to – is a shot across the bow of the status quo. Everyone in the region has known for decades that China wants to have her excessive maritime claims acknowledged, but a sneak attack on Singapore’s neutrality ratchets things up to a higher level. 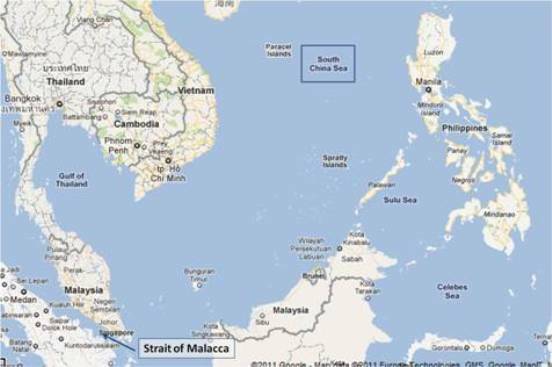 This move went straight for the central strategic interest of the US: the Strait of Malacca. 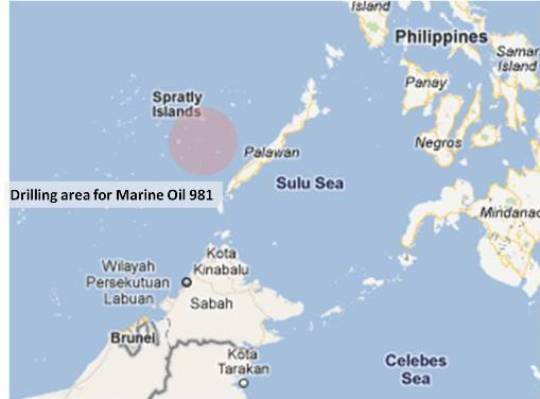 The next milestone in China’s effort to assert sovereignty over the South China Sea is anticipated to be the installation of a one-of-a-kind drilling platform in an area of the Spratly archipelago that falls in the Philippine economic exclusion zone (EEZ) (see map for approximate location). The giant semi-submersible platform is reportedly to be towed out from China and installed this month. If Marine Oil 981 is indeed towed to the proposed site, it is not clear what will be done about it. The Philippines has dispatched naval forces to patrol the waters in her EEZ, but in a naval confrontation with China, the Philippine navy would have no chance. Yet this is the move that cannot be allowed to stand. The maritime claims on which China bases her assertion of the right to install this platform are excessive by the terms of the UN Law of the Sea (UNCLOS) and conflict with the claims of the other nations with extensive coastlines on the South China Sea (see also here, and see map below). If China can force Marine Oil 981 on the region, without effective pushback, Chinese power will make the incremental but game-changing shift from regional challenger to regional arbiter of the status quo. Hillary Clinton is attending the ASEAN conference this week in Indonesia, where the most important topic will be sorting out the South China Sea. Her foray into this topic at last year’s ASEAN summit was decidedly ham-handed, sending “shock waves” through East Asia (the consensus of Asian opinion media) with the implication that the US was suddenly interested in arbitrating the disputed claims in the region. We can hope that this year’s expressions of American policy are more felicitous. We can also hope that a series of US Naval exercises with Vietnam, the Philippines, Australia, and others will act as a deterrent. But Asians are by no means sanguine about that effect. At a recent conference on defense topics held in the Philippines, a retired Indian general officer said of the prospect that the US might intervene to block China: “Forget the U.S. It will not happen. They are going to sleep.” Perhaps it’s too soon to render this judgment, but Jim Webb has good reason to be worried. China is pushing harder, in spite of the toughness putatively being displayed by the US with our joint military exercises around China’s perimeter. And the stakes are high. Analysts tend to focus on the economic aspect of the South China Sea disputes, in part because raw materials are the principal issue for most of the claimants. But for China, that’s only part of the story. This recent article highlights the significance of the South China Sea to China’s security posture; while I am undecided as to how much China wants to use the sea as a “bastion” for ballistic-missile submarines (it’s not an absurd idea, but has drawbacks), the point that China sees naval control of the sea as paramount is well taken. 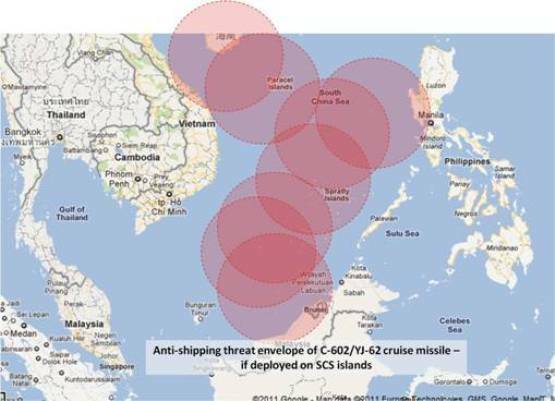 By exercising control of the Spratlys, Paracels, and other islands inside the “U-line” of her maritime claims, China could keep shipping through the area under a 24/7 threat from cruise missiles deployed in the islands. China’s intentions for the South China Sea are not analogous to America’s in the Gulf of Mexico; we neither exercise nor seek to exercise the same kind of positive control beyond the limits of our recognized claims. Independent of US policy, the first objectors to China’s posture in Southeast Asia are the other nations with legitimate EEZ claims, on which China proposes to infringe. The South China Sea dispute is about whether the US will enforce an international “rule of law” environment in which longstanding conventions are honored, smaller nations are not imposed upon, and threats to shipping are not allowed to gain the upper hand. Richard Fernandez is concerned that the US national debt, and Obama’s hope to expand it by borrowing more from China, will determine the outcome of the South China Sea drama. And China may well wait out the ASEAN conference and the 2 August debt-mageddon date before deciding when to haul Marine Oil 981 down to the Philippine EEZ. But if it is installed, media silence in the US will not be able to obscure the significance of the shift in the power calculus. Putting more US Navy ships in the area, exercising with the nations of the region, complaining publicly about China’s behavior – all of these are poor substitutes for blocking China’s big move before it happens. We must hope that can be achieved. we thank you for your VERY prompt (and thorough) reply. You have to like the degree of chutzpah indicated by that territorial claim. . .
yup, chutz-pah is slowly making it’s way around the world. For those ostriches who refuse to believe that China is driven by imperialism and other nefarious motives, do some homework. While not yet a Nikita “We will bury you!” Khrushchev moment, the ChiComs have been quietly attempting to do just that – and not only militarily – for decades. The irony re: Vietnam (South) and The Philippines is delicious. Both countries had a huge American military presence once upon a time and now look at them. When the Philippines kicked out the American military, did they make good use of Subic Bay and Clarke Air Force base? Not just no, but hell no. Within hours, both bases were looted and literally destroyed as “Flips” ripped off everything from bathroom fixtures to porch lights to sheets of corrugated tin to anything else they could haul away. As for Vietnam, well, we know all too well about their travails and problems with the ChiComs since America bugged out in 1975. I recall being incensed a few years back when China announced that they would be drilling for oil in and near the Gulf of Mexico. That Gulf happens to be the bailiwick of the U.S. and, to a lesser degree, Mexico. Emulate the Chinese and make the Gulf of Mexico off limits to foreign entities. 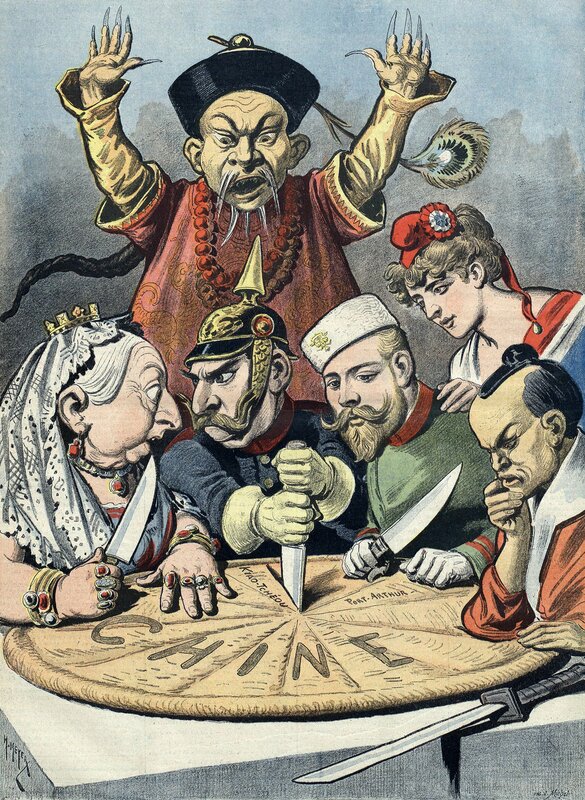 those WERE great days to be in China unless you were Chinese (and more interested in eating than in purchasing opium).